Come and explore the wonderful range of gourmet produce, cheeses, chocolates, loose leaf teas, coffee and other delights at Fancy Pantry. 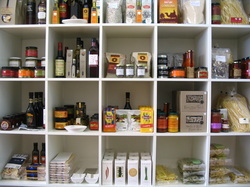 Fancy Pantry stocks quality produce, with a focus on West Australian products. A gluten free range of stock has been sourced and organic foods feature too. If you’re having difficulty finding a gift for someone special explore the options at Fancy Pantry. A unique range of gifts and home wares can be found, hampers can be created or a gift voucher can allow the recipient to choose something special. Our cooking classes provide participants with an opportunity to learn and practice skills through their hands on approach. Small class numbers allow for both individualised instruction and group focussed tasks. Come along for a fun filled session of fine foods and inspiration.